You will find contained within this virtual workshop, and portable desk, a mixture of ideas, projects on the go, rants and general communication with the world or not - as the case may be. The idea is to collate and curate the various interests that Shani has had over the past few years into one project due for completion in late September 2012. Shani is a mother of four adult children; the youngest – Toby - was involved in a very serious accident in 2005, which resulted in profound brain-injury. He is now 22 and receiving intense rehabilitation therapy. She also has four beautiful grandchildren and a life-long friend (who has played different roles during the different stages (literally) of her life). Oh and not forgetting "Mad Dog" Murphy to keep her on her toes. Shani is a handspinning, dyer and weaver, with a varied background involving commerce, art and is a published and performed writer. 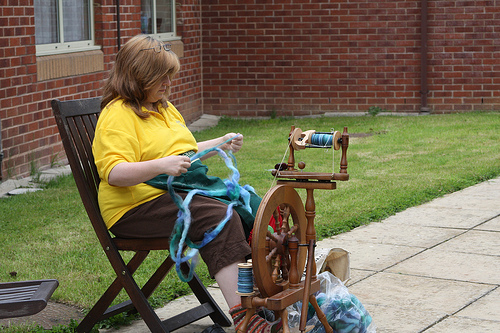 She now concentrates on producing textiles with a "twist" and has an interest in historic crafts. DyeVerse, her company, runs courses in colour, writing and textile construction, beginner through to experience, located in Wales and the South West.